This beautiful corner vacation home for rent in Sanibel Harbour features Gulf views from a large wrap-around screened-in balcony. Enjoy some of the breathtaking views of the pool and Gulf from the balcony and master bedroom. The kitchen contains all the conveniences of home, including tile, granite counter tops, and stainless steel appliances. The unit contains carpets in the living room and bedrooms. Enjoy top entertainment with flat screen televisions throughout. 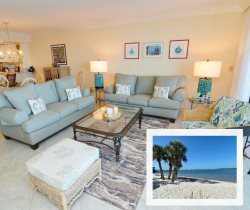 With a king bed in the master and two twins in the guest bedroom, this unit comfortably sleeps 6 with the sleeper sofa included, making this rental unit perfect for your next family vacation in Sanibel Harbour! You may have found this rental on HomeAway 4363854, HA ID 4363854, VRBO 4363854, or Vacation Rentals 4363854.